I’ve been to Sydney’s Olympic Stadium on two occasions when it appeared to be lit by tens of thousands of fairy lights. The first time was at the opening ceremony for the 2000 Paralympic Games. Each person attending the event was handed a small blue battery-operated torch as they entered the venue. The second occasion was the U2 concert in November 2006. Each audience member made their own contribution to the myriad tiny lights. Bono had asked the audience to switch on and open up their mobile phones, and wave them about. The crowd dutifully obeyed. As simple a stunt as this might have been, this was but one of a number of times that some form of 'new media' was used by U2 during their Vertigo tour. Live concerts by U2 are well known as innovative and impressive stage shows. Much effort going into the preparation. The dazzling live production is a result of significant investment in new technology, including video screens so large that they could rightly be called 'digital video curtains.' These were used throughout the concert to show images of the band, and also to display videos including various coloured patterns and a number of provocative messages. As well as the tour DVD, images and short videos of each concert taken by concert-goers can be found on sites such as YouTube, and various fan sites. Both on stage during performances, and afterwards, U2 have become both the subject and users of new media. However, not all fans appreciate the message. Today Bono is as well known for his political activism as for his songs, and he uses the concerts to encourage his fans to support his favourite charities. He mixes his political evangelism with the concert performances to such an extent that they almost become interchangeable. Consequently, technology is to the fore in spreading his message. After asking the audience to take out their mobile phones and switch them on during the concert, Bono then asked everyone to send an SMS with their name to a number. This site was set up to promote an event claimed to be the biggest anti-poverty rally ever. It took place the following week in Melbourne, under the banner of Make Poverty History. 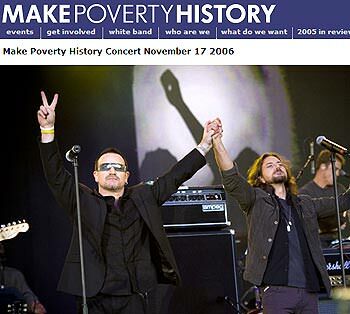 The culmination of months of public campaigning, Make Poverty History was a free concert held in the Sidney Myer Music Bowl in Melbourne on 17 November 2006. It was timed to coincide with the G20 meeting of central bankers and finance, also taking place in Melbourne. 14,000 attended the free concert, which was organised by 19-year-old Dan Adams. They were treated to unannounced concerts by both Pearl Jam, and The Edge and Bono from U2, as well as Australian musicians including Jet, Eskimo Joe, Paul Kelly, Evermore and the John Butler Trio. The use of new media to push a political message continues to grow. The Melbourne event website now includes a number of photos from the concert of both the artists and the audience. 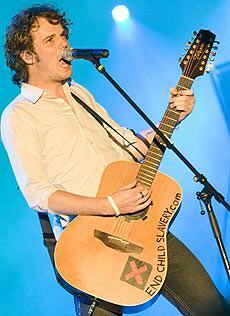 Guitarist Jon Hume from Evermore has continued the online promotion by making the website www.endchildslavery.com very visible on his guitar. u2tours.com is another serious fanzine with an area devoted to fans wanting to trade recordings of the shows. It also includes many reviews and photos of the concerts. The U2 forum on Interference.com has had over 230,000 posts just on the general subject of the Vertigo tour. There are separate areas to voice opinions about other topics including song choices, performances, costuming, and stage design. The level of detail supplied by these fans is exceptional, down to the number and complete listing of songs played at each of the 132 concerts that formed the complete Vertigo tour. Most concerts featured the more recent, overtly political songs such as Love and Peace or Else. At the concerts one sometimes becomes aware that there is a certain tension between the older fans, who are there to hear the music, and the younger generation. The messages that are thrust into the consciousness of concertgoers are direct, and employ the full array of effects available to the band. Recent articles by Margaret Cassidy. While the journeys made both by Alice and the children in The Lion, the Witch and the Wardrobe are about escaping reality, the arthouse film Pan's Labyrinth presents fantasy and altruism as the way to transcendence.